Wow, what a game on Monday night! Our Dallas Stars were shining bright! The crowd was loud, the AAC rocked! And every shot launched at Kari was blocked! Our team is alive, we fans have hope. We have no reason yet to mope! Anaheim thinks the Stars play dirty. If you’re gonna play hockey, don’t be a wuss! That the Stars aren’t polite, they’re not saying please. This is the playoffs, the game is tough. Don’t whine and cry if you can’t play rough. To Stephane Robidas, who used to be on our team. Bless his heart, his leg broke again. I can’t believe this happened to him. I don’t feel that Garbutt intended to harm him. Some things just happen, I’m so sorry he’s hurtin’. For Game 4 I will be in the building. I really can’t wait, my excitement won’t be yielding! I’m hoping for a victory to tie the series up. There is nothing quite like the playoffs for the Stanley Cup! It was a cold, crisp morning in early January, as four of my friends and I headed out to Frisco to go watch the Stars practice, as we had many times before. This was a little over a month since the Chicago Blackhawks game I had attended and witnessed Robidas break his leg. I remember the night as clear as day. A play deep in the Blackhawks zone that saw Stephane fall into the boards and land in a slump on the ice. Sitting in my seat and knowing Robidas, I thought to myself “Oh, he’ll get up. It’s just a stinger from hitting the boards.” As he laid on the ice longer and longer, I realized that the situation was much more serious than I first thought. SItting in the first row of the upper deck in section 330, I was leaning on the glass with my head in my hands, fearing the worst. All I ever knew about Stephane Robidas was seeing him get up after virtually everything that was thrown at him. Now, seeing him lying on his back on the ice of the American Airlines Center, I couldn’t believe what I was witnessing. My heart was wrenched even more as I saw the door to the away locker room open and saw the EMTs bringing out a gurney to place Robidas on. I was on the verge of losing it seeing a player I had always loved being carried off the ice on a stretcher. That was, until January 3rd. Practice went on as normal with the Stars just coming off of a loss the night before to the Montreal Canadiens. As I always do, I took photos of the guys doing their drills and having their fun once the main part of practice had ended. Still, nothing was out of the norm. Once the majority of players had left the ice, it was then that we decided to head to the hallway outside of the locker room where the players all came out of. We waited a good twenty minutes, anticipating one of the first people to come out to be Jamie Benn or Kari Lehtonen. The door opened, and Kari stepped out, and made the rounds to sign autographs for everyone who was there, while also taking the occasional photo. Once he had left, we waited a few minutes more, anticipating the next guy to come out. The door opened, and who walked out of that door was someone that I never expected to see. Stephane Robidas walked out of the locker room. This was the first time I had seen him in person since November 29th when he broke the leg. Only this time, he had no evidence that his leg was snapped in half, except for a minor limp. I could not believe my eyes seeing him standing right in front of me after my last memory of him. As every other player had, he walked down the line, signing autographs, except there was a feeling of excitement in the air in that small hallway seeing Robidas on his feet without crutches. He worked his way down to where I was standing, and once he got to me, I decided to pop the question how his leg was doing. He looked at me and responded with “It’s feeling good. Hope to be back soon.” I decided I might as well get a photo with the star defenseman, and it was a good thing I did, because that would be the last photo I ever got with Stephane. I know for me, until Brenden DIllon entered the fray, Stephane Robidas was easily my favorite defenseman since Sergei Zubov. As were many Stars greats of the past, he was a class act on and off the ice. He fought hard for the club and knew how to go about the game with a sense of toughness, but at the same time, doing what was right for the team. After all his years in Dallas, I would have never thought to hear the words “Robidas” and “trade” in the same sentence. So, it would make sense that on March 4th while in school and scrolling through Twitter, when I saw Bob McKenzie tweet: “Lots of chatter out of DAL that Stephane Robidas may be headed to ANA. No official confirmation yet on that, though. #TSN #Tradecentre” my heart immediately sank. I was hoping what I was reading was not true. In a matter of a half hour, what I hoped would not happen did happen. I sat in my car after class with a sense of numbness and shock after what had just transpired. In this short time after the trade, I’ve found my best remedy to seeing Robidas leave is knowing that he’ll have a chance at winning the Stanley Cup he deserves. 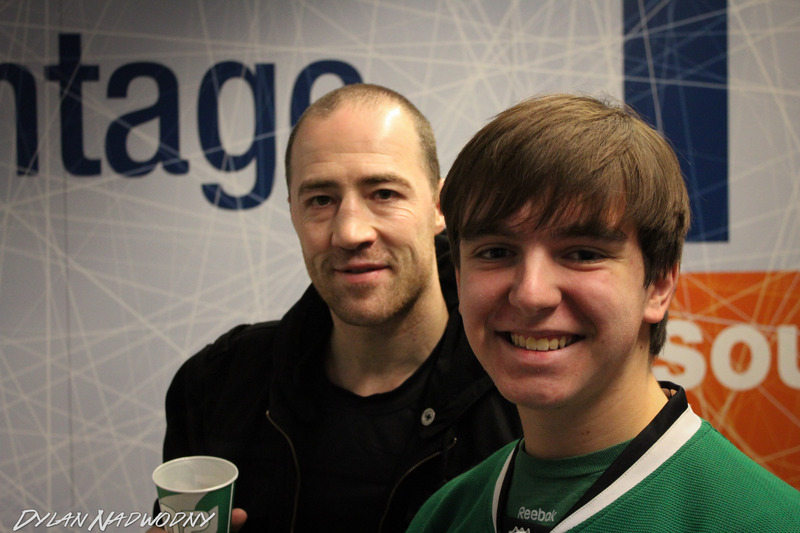 I’ll always remember Stephane Robidas as a true professional, and a mentor to my favorite Stars player right now, Brenden Dillon. Most of all, I’ll remember his sincerity and dedication to the Stars organization that many in sports seem to forget. No matter what jersey Stephane is in, I’ll always remember him best as a Dallas Star, and it will always remain that way. Once a Star. Always a Star. I met Stephane Robidas a few years ago when he left practice in Frisco. My boyfriend and I waited outside with other fans for him to sign a puck. When he came out to greet fans, he took a bite out of what looked like a hoagie. My boyfriend asked for his signature, and being the great guy he is, Robi said, “sure!” and set aside the sandwich. My boyfriend looked at the sandwich and commented that it looked tasty, and that the sight of it was making him hungry. Robi said, “It’s good. My wife made it!” Referring to me, he said, “She didn’t make you one?” and he gave me a wink and a smile. Hahaha!